Where are we right now in world happenings? You read the news daily, you listen to it on news casts, you read it in your newspapers but where are we right now and what is going to happen next as the world turns in world events. 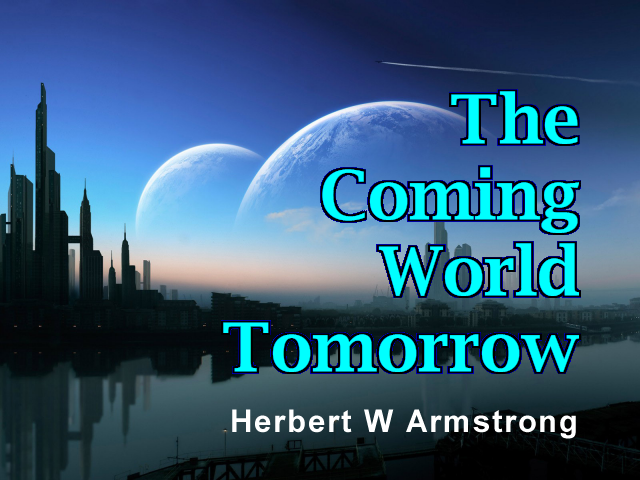 The World Tomorrow, the Worldwide Church of God presents Herbert W Armstrong... Internationally recognized Ambassador for world peace... Visiting prominent leaders around the globe... discussing the cause of world problems... and proclaiming the good news of the world tomorrow... ladies and gentlemen Herbert W Armstrong. Very few people realize that the Holy Bible devotes about one-third of all of its space to biblical prophecy of things that are going to happen in the future from here on. Perhaps ten percent of prophecy is already happened, has already occurred but about ninety-percent of all prophecy in the Bible is devoted to things in the world today and things that are soon going to happen and yet if you go to church and you here sermons or if you listen to religious telecast or broadcasts. You don't hear much about that. You don't hear anything about the news of the world and the prophecies of the Bible. About one-third of the Bible is devoted to history going back to the beginning of mankind and how human life has developed. I have mentioned how months ago now the atomic scientists came out setting the Doomsday Clock one more minute forward from four to only three minutes now to midnight and midnight is the end of this world or civilization as we know it. There's a great deal of talk here and there although people try to get it out of their minds about nuclear warfare and what will happen. The weapons of mass destruction have now come to the place and been produced that can absolutely wipe human life completely off of this earth. Erase human life completely and there won't be a man; woman or child left alive on the earth and that is the thing that is the biggest problem of all facing mankind today. The number one problem in the world today is that of human survival. Now it's all recorded in the Bible about a third of the Bible is devoted to doctrine and to teaching to telling us the purpose of life. The way we should live and all of that sort of thing but if you attend church you never hear the other two-thirds of the Bible about the history of what has happened all through these years. The history of nations, of empires and of the prophecies of what is going to happen and yet about two-thirds of all the Bible is devoted to those two subjects of history and prophecy which is history written before it happens history of the future. Well now looking into the Bible where are we right now? One of the greatest prophecies in the Bible is recorded in Matthew 24:3 and that's the prophecy of Jesus and beginning with verse three in Matthew twenty-four; "as Jesus sat on the Mount of Olives, his disciples" and there were four of them actually "who came unto Him privately asking Him when shall these things be?..." Now the things they referred to He'd just been talking to them about the buildings of the temple and telling them that the temple was going to be destroyed. Totally destroyed till one stone would not be left upon another and they said, "tell us when shall these things be?..." He had said that the temple would be destroyed in their time, many would come preaching another gospel and they did and saying that Jesus was the Christ. Preaching about Jesus but not preaching His gospel and He said to be not deceived but they were deceived, many of them and the world as a whole was deceived at that time. Then they asked another question which they thought would happen at the same time which actually hasn't happened yet and was to happen more than nineteen hundred years later. "...And what shall be the sign of your coming and of the end of the world?... ", the end of this civilization as we know it. Jesus answered, this gospel, of the Kingdom that is the gospel He preached, was not preached for nineteen hundred years after Christ was crucified and went to heaven. Inside of about twenty or twenty-two years after Christ went to heaven, after His crucifixion, after His death and resurrection that gospel that He preached was replaced with the gospel of men, about Christ. They merely preached a message about Him and so the gospel today seems to be trying to tell people about Jesus, about Christ. But the message that Christ brought from God. The message of Christ Himself, the gospel of Christ they let alone and they don't tell you. Now He Himself said, when this gospel He preached, "the gospel of the kingdom of God is preached in all the world for a witness unto all nations" then He said would come to the end of this world. So what are you listening to right now is the sign which Jesus Christ Himself gave of being new the end of this civilization as we know it. And it is remarkable that during the time of this program as I say during the last fifty years, that the weapons of mass destruction have finally been brought into existence, atomic and nuclear warfare, the hydrogen bomb that can absolutely whip out all human life off the face of this earth. We've come to the time when humanity can be destroyed and it was during the time when this very program has been proclaiming the gospel of the kingdom of God. And I don't know of any other program proclaiming that gospel and if you do I wish you would write and tell me. I would like to know. I don't think it's possible that some other program is proclaiming it and it hadn't come to my attention. But then after this now dropping down now to the 21st verse Jesus said, "...for then" after this gospel of the kingdom is proclaimed, which you are hearing in your ears this moment, "then shall be great tribulation..." That is a time of world trouble. Just trouble in the world and it seems like there has never been trouble such as we're in today. It's going to get worse. We're not in the time quit here to describe as yet. We're coming into it. We're at the rumblings at the beginning of it now. "Then shall be great tribulation such as was not from the beginning of the world to this time no nor ever shall be." (22) "And except those days should be shortened", the days of this trouble, "there should no flesh be saved alive." Not a human being would be left alive but for the elects sake those days shall be shortened. For the elects sake those are the real elect in God's church. And people have lost sight of the real true church of God and where it exists today. But for their sake, those in the true church of God, God will intervene and will stop the hellish mess of the nuclear world war III that is almost upon us now before it does completely annihilate all human life off the face of this planet. But I'm here to tell you that Bible prophesies says millions upon millions are going to be killed and are going to die in the trouble that is soon coming. And I can't tell you if that trouble is going to come in the next one or two years, or the next three or four or five years but it is very very near at this present time. Now I want to give you some more of those prophecies. I would like to have you notice beginning with verse 29 of that same prophecy now, "Immediately after the tribulation of those days...", now God is going to cut them short by super natural intervention, super natural intervention from the power of God Himself. You know it's a question today you ask people, do you believe in God? And a lot of people say oh yes I believe in God, but actually do they? Any idea that most people have of God is so very very vague. God is not real to people. Do you think of God as one person? Do you think of God as a trinity as three persons? Let me tell you the Bible says God is neither. But I won't go further into that just now. Now "immediately after the tribulation of those days shall the sun be darkened and the moon shall not give her light and the stars shall fall from heaven..." In other words up in the sky there will be super natural signs. This is the intervention of God almighty. This is not something men will be doing. This is not something the nations and their military forces will be doing. This is something God is going to do to intervene and stop men from slaughtering one another. And He is going to bring this world peace believe it or not. I have good news for you beyond all of this. Humans are going to go through this terrible time. They're going to learn a lesson. We're only having trouble and problems that seem unsolvable in the world today because we're not living according to God's way of life. God's way of life is simple summed up in the one word "Love" and it is love to God and people have very little love for God today and love to fellow human beings. That is to have a much regard for the good and the welfare of other people as you do for your own self. Very few people have that kind of love today. Everyone is concerned for himself. It's always me first. I want to get mine. Everyone is doing his own thing today. Leaning to their own understanding as the Bible puts it. "And then", when this all happens, those signs appear up in the sky "shall appear the sign of the son of man" and that is what Jesus called himself, "the son of man, in heaven and then shall all the tribes of the earth mourn and they shall see", that is the nations of the earth "will see the Son of man coming in the clouds of heaven in power and great glory." and He's coming and this you don't hear preached very much in churches today. Christ is coming back to this earth to rule all the nations of this world. Now I want to read you a little prophecy back in Joel 2:31, it says: "The sun shall be turned into darkness and the moon into blood..." Now I just read that just after this great tribulation, that will happen, the signs in the heavens and that will happen before the great and terrible day of the Lord come. You know we've been for 6,000 years in the day of man but actually in the day of Satan the devil. Satan the devil has kidnapped this world and the world doesn't realize that it's been kidnapped and loves the way of the kidnapper more than the way of its potential father who is God. And the world has been going the way of its kidnapper ever since. But now notice, "the sun and the moon are to be darkened and these signs will be seen up in the sky to end all of the trouble that is coming on the world but that will happen before the great and terrible day of the Lord come". And God is going to punish the world for its sin to wake the world up and bring it out of its sins because sin is the transgression of God's law and God's law is God's way of life. That's the way of love so we can have peace and if we live that way we would have peace and we wouldn't have troubles on the earth. We wouldn't have our problems and our trials that seem unsolvable. If we only lived the way God says we should live and He's going to punish this world but it will be after the world brings its own troubles on its self through the great tribulation. Now first is going to come the great tribulation then will come the signs in the heavens according to Joel 2:31. And then will come the day of the Lord and that is the day when God is going to intervene and God is going to begin to send to govern the world, He will send Jesus Christ who was here over 1900 years ago in the human flesh. But Jesus Christ said if I go to heaven, which He did, He said He would come again and He's coming again as the King of kings and the Lord of lords to rule over the United States to rule over the British nations to rule over Canada, over Japan, over Russia, over China, over France, Germany all the nations of the world and our present governments by men and politicians is going to be banished. Why don't you hear things like that preached? That's what your Bible is all about. And the Bible is the word of God which God sent a message from God almighty and ministers of the gospel ought to be preaching it. Gospel means good news and Jesus came with a gospel which is good news and it's about these things I'm giving you some of that good news on this program. Now in 11th chapter of Daniel is the longest prophecy in the Bible and in verse 40 of chapter 11 (Daniel 11:40), it begins; "And at the time of the end..." and that's the time we're in now. Then it continues on in the 12th chapter which is continued and uninterrupted; "And at that time in the time" of the end I've been reading you prophecies about the time of the end. "At that time shall Michael stand up, the great Prince which standeth for the children of thy people." Michael is a great arc Angel a cherub when Michael stands up there be a time of trouble such as never was since there was a beginning of the world up to that time. Now here's the same time of trouble I just read to you in Matthew 24 in the prophecy of Jesus there can't be two times of trouble of the greatest that ever happened "...And at that time, Thy, God's people shall be delivered everyone that is found written in the book." Now what time is that? "And many of them that sleep in the dust of the earth shall awake in a time of resurrection some to everlasting life" some are going to be resurrected to everlasting life at the second coming of Jesus Christ. Now then we go right on from that into the 12th chapter of Revelation where you find the same thing is mentioned again. "There was war in heaven Michael and his angels fought against the dragon and the dragon fought and his angels." Now the dragon is Satan the devil and his angels are demons; "And prevailed not", that the devil and the demons did not prevail "neither was there place found anymore in heaven." Now that is something to happen about our time now or very, very, very soon; "And the great dragon was cast out", now who was he? It tells you right here who he was, "that old serpent called the devil and Satan which deceiveth the whole world:..."
Did you ever stop to think that means you yourself have been deceived? That means me too, I was deceived. But God has opened up the Bible to me and has undeceived me and I see the truth now but I was deceived. You don't need to remain deceived but you have been, you who are looking at me and listening just now. You have been deceived everybody on earth has been deceived except Jesus Christ when he was here. "That great dragon was cast out of heaven." Now "that old serpent which is the devil and Satan which deceiveth the whole world he was cast out into the earth and his angels [or demons] were cast out with him." The world doesn't seem to know that Jesus was born to be a King ruling all the nations of the world. In the ninth chapter of Isaiah verses 6 and 7 (Isaiah 9:6-7), I won't take time to read it but it says that He would be born as a baby, as Christ was and He would grow up but He was to become a King and His name would be called and Emmanuel which means, "God with us" in the human flesh and He did come with a message about the kingdom of God and the kingdom of God is at the time of the government when Christ will be the King and the prophecy is that He would come to rule and reign over all nations and that was proclaimed to Mary just before Jesus was born. Now Jesus said in the 14th chapter of John in the New Testament and verse 3 (John 14:3); that He would be going to heaven and He did after He was crucified and resurrected and He said if He went to heaven He would come again and when He comes again He's coming as the King of kings and the Lord of lords to rule over all the nations of this earth (Rev. 11:15). Why don't you hear that preached in the churches and you don't realize that the earth is almost on fire and the terrible thing is going to come on us but after that people are going to learn their lesson God is going to intervene and then He's going to bring His peace and prosperity and immortality and eternal life and all of the good things that we could ever hope for. Jesus said in John 14 (John 14:3) that He would come again and the church He would receive to Himself and when He comes again they will be with Him right here on earth where He is. He is going to rule all nations and there's going to be an end of all of the satanic trouble that we have been in. Selfishness is the root of all of it. People are ignoring the laws of God. God's law is the law of love of loving one another instead of selfishness, instead of competition, instead of vanity, instead of having malice of jealousy and envy toward other people. Always getting, wanting, trying to get the best of everyone else, trying to get the best of every bargain, trying to take away from others. Now when Christ does come again let me read you what finally is going to happen it's in Isaiah the 2nd chapter beginning with verse 2 (Isaiah 2:2); "it shall come to pass in the last days that the mountain of the Lord's house shall be established at the top of the mountains." Now here it is speaking symbolically and mountain is merely used in symbolic language to represent nations. The mountains are the great nations like the United States, and like Britain, and like Russia, and like Japan, and China and nations like that. "...The mountain of the Lord's house" that'll be the kingdom of God, "shall be established in the top of the mountains" or of the great nations "and it shall be exalted above the hills" that is the smaller nations "and all nations shall flow unto it." (3) "And many people shall go and say, Come ye, and let us go up to the mountain of the Lord and of the house of the God of Jacob and He will teach us of His ways..." That is the ways of love, the ways of loving one another and having concern for the good and the welfare of others instead of trying to take away from them and trying to be selfish "and He will teach us of His ways and we will walk in His paths for out of Zion [that's from Jerusalem] shall go forth the law [that's the law of God] and the word of the Eternal [or the Lord] shall go forth from Jerusalem (4) and He or God shall judge among many nations and shall rebuke many people and they shall beat their swords into plowshares" this is what is going to happen after Christ comes back to the earth again. "They shall beat their swords into plowshares and their spears into pruning hooks." Nations shall not lift up sword against nation neither shall they learn war any more..." but we will have world peace at that time and that is what is coming that is what is prophesied for us. I want to offer you a booklet on the condition of the world today. The world you live in it is A World Held Captive. A World Held Captive and loving the way of its captor which is Satan the devil more than its potential father which is God. A World Held Captive. You've never read a book like this. This is something right out of your Bible. You need to blow the dust off your Bible I've been saying that for the last 50 years and see the message of God the message that God sent for all mankind. This is a booklet that open your eyes you need to know about the world you've been born into the world you are living in and the kind of a world going to live on into that is going to happen the next 2, 3, 5, 10 years, because all these things I've been telling you on this program are going to happen in our lifetime. I may live that long and see it all myself. Now at the same time I would like to send you a year's subscription to the finest magazine in this world and it's one of the world's great mass circulation magazines one of the largest circulation magazines on earth "The Plain Truth". Over 7 million people have subscribed to it or pick it up at newsstands. It is talking about today's world news and it analyzes what you are getting on your newscasts and in newspapers and gives it from the light of biblical prophecy and where we are and what it all means giving you understanding of the events that are happening in your life and in the world in which you live today there is no magazine like it there never has been there is not today. Every issue has an editorial by me and the one here is, "Understanding the Way to Peace." Then here is an article, "The Election of the Decade." Here is an article, "The Colossus in the Making in Europe." A gigantic colossus that'll be greater than either the United States or the Soviet Union and it is being formed in Europe right now and you need to know about what is going on over there. Here is another article, "There is a Perfect Government," but you don't find it on the earth at the present time but there's going to be a perfect government. Here is another article, Four Great Qualities of Leadership," and so on. It's a magazine of understanding. A magazine that will give you understanding of world news and what is going on in the world today there is no magazine like it. Now that the request for money we don't follow it up begging for money we have nothing for sale. Now you just send your request to me Herbert W Armstrong at Pasadena California that's the only address you need. Just Herbert W Armstrong Pasadena California the ZIP Codes 91123 or many people would rather just go to the telephone and get it immediately so go to the telephone and there's a free call. You dial 1-800-423-4444 that is 1-800-423-4444 that's a free call just call and ask for the booklet and the Plain Truth if you're not already a subscriber to be sent to you as quickly as possible and so until next time this is Herbert W Armstrong goodbye friends.